Gregory Green is internationally recognized for his challenging work and the numerous controversies it has spawned in the USA and Europe. Since the mid-1980s, Gregory has created artworks and performances exploring systems of control and the evolution of individual and collective empowerment. Greens work considers the use of violence, alternatives to violence, and the accessibility of information and technology as vehicles for social or political change. Referencing historical precedents and disturbingly anticipating various historical events, such as the tragedy of 9/11 and the Arab Spring, Greens provocative works expand the parameters between art and activism, culture and social commentary. With over 30 one-person exhibitions and 100s of group exhibitions Gregory has played a significant role in the Contemporary Art discourse of the last 20 years. His work is included in major public and private collections, including among others the Museum of Contemporary Art, Los Angeles, the Tate Gallery, London, the Saatchi Gallery, London, the Museum of Modern Art, New York, the Whitney Museum of American Art, New York, the Mori Museum in Tokyo and MAMCO, Geneva among others; and his work is represented by numerous commercial Galleries in Europe and the United States. Associate Professor Green was born in New York State and raised primarily in Europe. He was a working Artist in New York City for 18 years until joining the faculty at the University of South Florida, Tampa, in the fall of 2006, where he now resides, and continues his studio practice. Gregory attended undergraduate school at The Art Academy of Cincinnati and graduate school at The School of the Art Institute of Chicago. 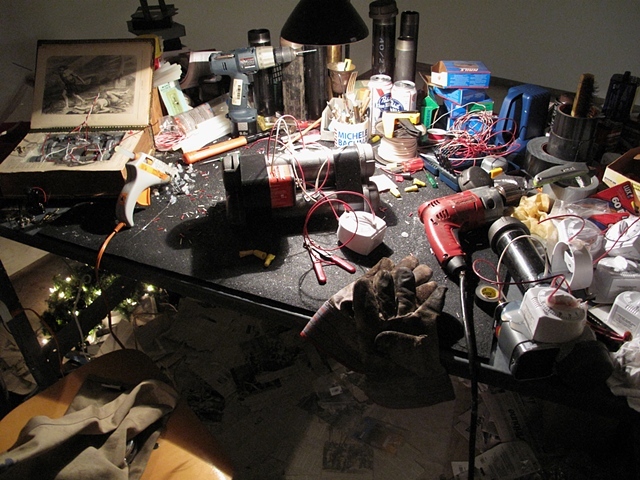 The homepage image is a detail of a recent installation at the Walker Art Center, in Minneapolis: "Worktable #9, (Minneapolis), he of Righteousness", mixed media installation, approx. 12' x 15' x 8', 2011. Image courtesy of the Artist and the Walker Art Center.